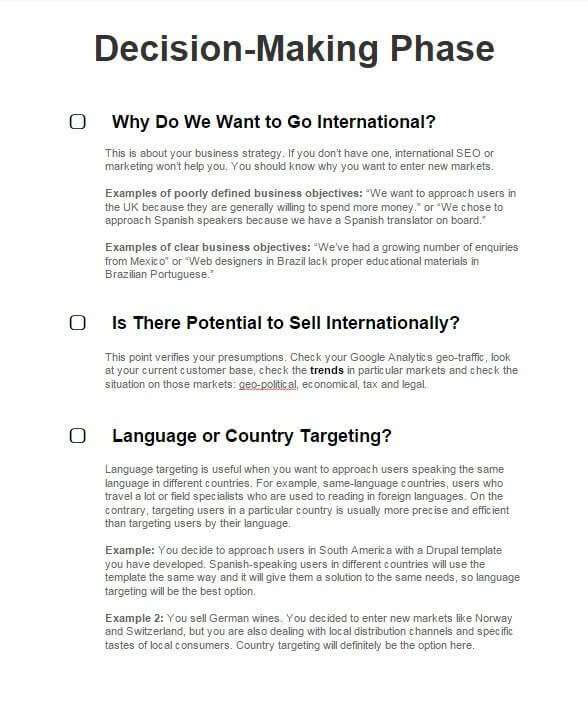 Your international SEO activities may break into pieces in any phase. I’ve gathered my best practices and created this 56 point checklist that will help you prepare your website for international visitors. You can also download a Google Docs version of the checklist here. Why Do We Want to Go International? This is about your business strategy. If you don’t have one, international SEO or marketing won’t help you. You should know why you want to enter new markets. Is There Potential to Sell Internationally? This point verifies your presumptions. Check your Google Analytics geo-traffic, look at your current customer base, check the trends in particular markets and check the situation on those markets: geo-political, economical, tax and legal. Language targeting is useful when you want to approach users speaking the same language in different countries. For example, same-language countries, users who travel a lot or field specialists who are used to reading in foreign languages. On the contrary, targeting users in a particular country is usually more precise and efficient than targeting users by their language. Example: You decide to approach users in South America with a Drupal template you have developed. Spanish-speaking users in different countries will use the template the same way and it will give them a solution to the same needs, so language targeting will be the best option. Example 2: You sell German wines. You decided to enter new markets like Norway and Switzerland, but you are also dealing with local distribution channels and specific tastes of local consumers. Country targeting will definitely be the option here. Before making any decision regarding which markets you will focus on, go through your historical sales data, competitive data, search data and market data to identify which markets to focus on. You may be surprised that the best markets for you don’t have to be the ones you originally thought about. Are We Able to Build an International / Multilingual Team, or Would it Be Better to Outsource That? Once you start your multilingual SEO campaign, you should ensure the smooth running of it. Sudden cut down of the campaign is a bad sign for users and search engines. Make sure you have capacities available before launching your international SEO activities. Are We Able to Manage International Projects Ourselves, or or Would it Be Better to Outsource Them? Different costs: the costs of a local SEO company in India and in Germany can differ substantially. Which Languages Are We Able to Cover in Help Desk? The languages in which you provide customer support may have a direct impact on customer retention or even acquisition. Will We Have a Budget if the Work Is Outsourced? Plan your budget in advance to ensure the outsourced work will be continuous under any circumstances. Direct or indirect competitors may give you a lot of additional data. However, never copy your competitors: they’ve probably earned their rankings for a reason. Get inspired and extend your content by the keywords found to make it more valuable for your audience. Research topics that are not covered by the competitors and fill the gap. Use the insights provided by the native speaker to search for social media buzz. What social media platforms are used? You can find out using eMarketer or find your favorite tool here: 20 Free Buzz Monitoring Tools. Is There Clear Demand for Our Product? If Not, Can We Wait for It to Grow? Based on the keyword research, you should find out in which phase your audience is: See – Think – Do – Care. Are they clueless about your product and how to use it? See phase. Are they aware of it (social media buzz) but not searching for it yet? Think phase. Are there product-related keywords? Do phase. Do the keywords mirror their difficulties in using the product? Care phase. The earlier the phase, the lower the competition but the more time required to get the audience used to it. The later the phase, the greater the competition, but the faster the response. Now when you have all the necessary data available, clearly define your key markets you want to target. After the release of Google’s Pigeon update, country targeting is often more efficient than language targeting. If you have a purely global product, define your buying personas for each market separately. Decide if you want to implement e-commerce into your website. This will affect the subsequent analytics implementation, as well as the strategy. Choose the official communication language(s) to avoid future misunderstandings. This language should be fluently spoken by key team members. Payment methods vary substantially from country to country. PayPal is rather common in the US and Western Europe, while Eastern Europe prefers cash on delivery (Russia, Poland, Slovakia, Ukraine). In some countries like Germany, users prefer invoices and deferred payments: they only pay in advance when they get a discount from the overall price. In China, the most frequently used payment gate is AliPay, while in the Middle East, Payfort is preferred. eMarketer provides comprehensive data regarding the most frequent payment methods by country. Does your product/service require customer support? Don’t assume your customers will be willing to speak your language, especially when targeted in their local language. An upset customer may ruin your reputation on local discussion forums pretty easily and you may not get a chance to respond. Decide who on your team will be given this responsibility or consider hiring a local help desk provider. You can find pros and cons of an outsourced helpdesk here: Stop Outsourcing Help Desks. Local alerts allow you to monitor new mentions about your brand or desired keywords. Use Google Alerts or Mention.com. Your product is perceived by global users very similarly: e.g. you are targeting a specific group of users (Drupal developers, golf players or brain surgeons). Best TLD solution: Use a single TLD and communicate in one language that prevails within your audience. You can later add subfolders e.g. /de/, /ru/ to provide multilingual content. This means you want to target local users individually, as you may be providing local support or simply want to cover their individual, locally specific needs. You realize that country-specific traffic dominantes on the language versions of your website (e.g. users landing on your German website are mostly from Germany or generally convert better). Best TLD solution: ccTLDs or gTLDs that work particularly in the target market. Check what TLDs appear in local SERPs for the keywords you are targeting. You may be a local attraction, a hotel, restaurant, university or a local ticket reseller. This one is obvious. Learn from the skoda.com example: Skoda.com Case: Can We Get Our Domain Name Back? Some search engines, like Baidu and Naver prefer locally hosted websites. The higher the distance from the server to the user, the higher the loading speed, and it can extend by even seconds. If you are targeting distant users, you should definitely consider setting-up local web hosting or go with one of the global web hosting solutions. Basically you have two options: an open-source CMS and a tailor-made CMS. 1. Open-source: E.g. WordPress, Joomla, Drupal, OpenCart. Cheaper and quicker to set up, plugins and modules available for multilingual/multi-regional websites (website structure, localization, page equivalents, hreflang etc.). Decent e-commerce integration options. 2. Tailor-made: Suit specific needs better. More suitable for specific payment options (e.g. payment gates in specific countries like China), better support of non-ASCII websites (Arabic, Chinese, Korean, …), better integration of special features like specific discussion boards, back-end features for registered users, etc. Better support of complicated global website structures (e.g. combination of TLDs and subfolders). Your actual product / services structure: If you are running an ecommerce website, make sure to put the right products into the right categories. The market priorities: Put the things people are looking for higher in the website structure. Your brand priorities: Key content should also be put higher in the structure. Search engine priorities: Some search engines like Baidu favour simple structures without deep pages. It is advised to keep within 3~4 levels even for big sites. Also, don’t forget about website search results pages, pagination pages (page 1, page 2, page 3), filtering etc. Find more about how to build a website structure here: How to Create an SEO Friendly URL Structure. If you are using subfolders, you must retain those subfolders for any URL within the same website language version. could be the Spanish version of your website that you decided on. is an example of a page, while /es/ must remain for any Spanish content. The language of each and every URL should correspond to the content under this URL. Localize your URLs first to nest the new URLs in your global website structure at this stage. The best practice is to match the title and leave out the so-called “stop words”. while “di” was dropped from the URL as a stop word (conjunction). You can find the most common ways of transcription/transliteration in this Wikipedia article. Each of your products or services should be represented by a landing page. If you are running an ecommerce website, category pages will probably be your key landing pages. Create separate LPs’ equivalents in every language/country version of your website. Draw the website structure in a simple chart and identify equivalent pages across the multilingual/multiregional website. This roadmap will give you a clear idea how to plan for localization or where to implement hreflang tags. This is the content that defines your global brand: About us pages, partner pages, Mission & Vision etc. Anything that describes your brand on a global scale. Your marketing content should clearly speak the language of your audience: Landing pages, product pages, home page. All manuals, product descriptions, documentation, FAQs, user guides etc. should be translated accurately to avoid any incorrect use of your products or services. System texts often involve different locales: time and date formats and timezones, metric units, form items (address, ZIP), phone extensions, etc. That’s why regular translation gives you barely applicable nonsense-content that requires a lot of correction. Your contact information should be created from scratch and include relevant contact details for your users. Select the best localization tool to achieve the best quality and consistency of the texts. This Wikipedia article will help you pick the best one. Based on your website structure, write the content for every page within. “Write for translation”. Focus on the features every page should have according to your localization strategy above. Make the content neutral and easy to read. Create multilingual content of your website according to the localization strategy. Prepare a brief and run the localization project with the workflows above. Once you have completed the localization project, export the files and implement the content into your website. Pick internationally understandable icons: envelope, books, cameras, clocks, eye glasses, microphones, planes, trains, scissors, rainbow etc. For further inspiration on this topic, see this research performed by Tampere University of Technology. Use further tips from my Pinterest board Intercultural Signs and Symbols. Especially if you are dealing with users in different parts of the world, individual language or country versions of your website should correspond to the local user experience rules. Eastern countries like China, South Korea or Japan prefer deep website structures that are rich in written content. They generally like to scroll and discover information they need themselves. Whereas in the Western part of the world, the design is rather straightforward and visual. Consult the usability elements of your local versions with a local UX specialist. You can find very good local usability examples in the article: Why Japanese Web Design Is So Different. Make sure your multilingual website is properly geo-targeted. If you use regional ccTLDs (domains), your basic geo-targeting is sorted. Otherwise, make sure to properly name your subfolders using the ISO codes for language or country, or both separated by a hyphen (“language-country”). Hreflang tags are NOT a ranking signal nor an ultimate solution for a international websites. If your global website does not use ccTLDs, you’ll need to mark up equivalent pages with hreflang annotations. Find more in The Ultimate Hreflang Guide for Dummies. You can now set a different target country for either domains, subdomains ore subfolders in Google Search Console, Bing Webmaster Central and Yandex Webmaster Tools. Do it if you want to target by country. Make sure to use your NAP information (name, address, phone) consistently across your web and all business listings. Tools like Yext should help you with the consistency. Mark-up your NAP information with schema.org. Remember that website IP is a key factor when determining the source of your backlinks. Use tools like Majestic SEO or Ahrefs to find out from which countries you have the most backlinks. Your backlink geo-portfolio should match your geo-targeting intentions. 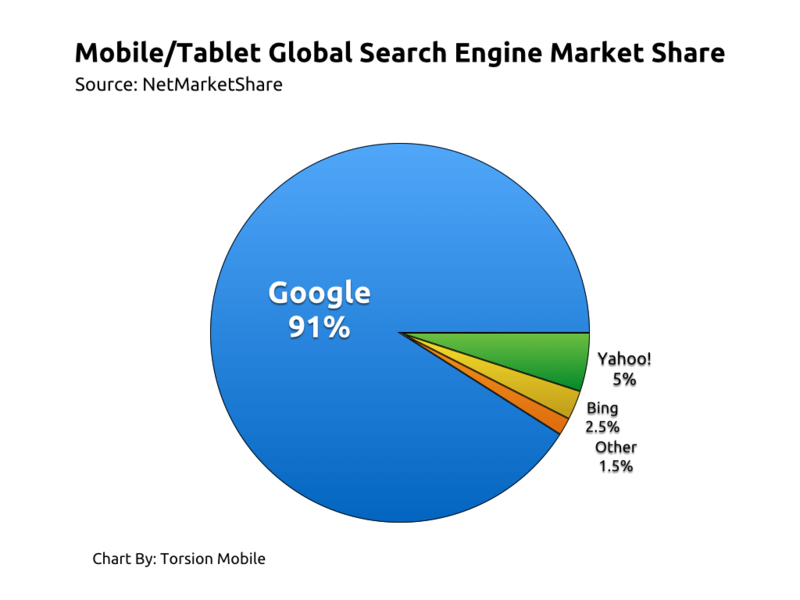 It is no longer true that Google dominates globally. For example, Chinese search engine Baidu held 17% of the global market for desktop. Each search engine has different preferences. Yandex disregards backlinks. For Baidu, meta tags and server location still matter. Bing uses similar criteria as Google, but differently balanced. The nuances are described in many articles, but the essential part is described in Webmaster Guidelines: Bing, Google, Yandex, Baidu, Naver. Run the basic on-page SEO checklist to make sure your website is search-engine friendly for all of the search engines you are targeting. This list may help. 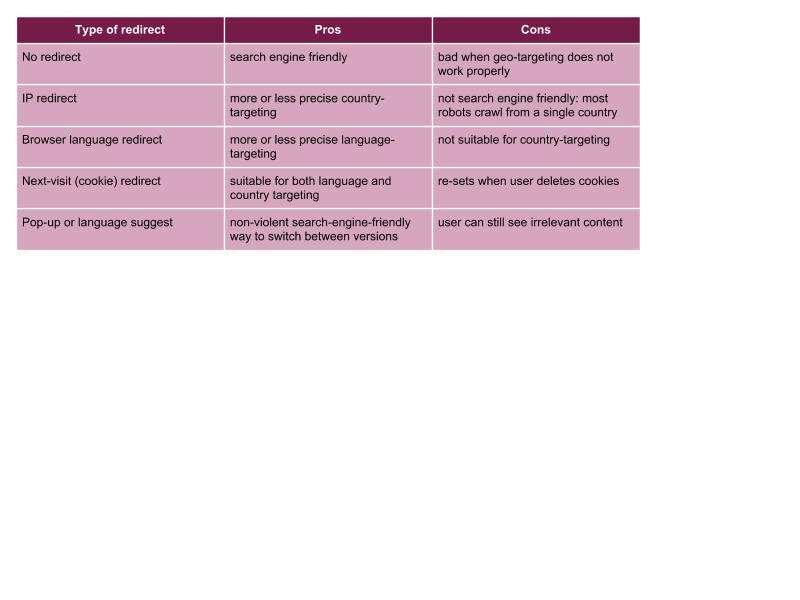 Check Webmaster Guidelines (above) to meet individual requirements of different search engines. The question whether to have a single tracking code or multiple tracking codes for each subfolder/subdomain depends on a lot of factors. In general, if other subfolders/subfolders are mutually equivalent, it may be worth implementing a single tracking code and define traffic differences using segments/filters in Google Analytics. This will give you the idea of how users are moving through the whole website. If you are running different TLDs at the same time or the content on the separate subfolders/subdomains is rather different, you can go with multiple tracking codes. Now it’s time to implement a tracking code on your website. Today’s standard is generating a Google Tag Manager code and placing it across all pages on your website. By using Google Tag Manager, you won’t have to implement the tracking code from scratch every time you re-design your website. Create reports in Google Analytics and Webmaster Tools so you can regularly check the KPI values. The worst thing you can do is to make a single strategy and try to communicate with different target groups with different desires the same way. Instead, segment them by common behaviours. This spreadsheet will help you research channels and behaviours of your different language groups so you can later decide on which tactics to use. Users search for particular brands they trust, and use general keywords to search for products and services. Often searches occur in different languages where there are more resources. The strategy you should go with is building brand awareness through relationship linkbuilding and media / influencers relations. There are high volumes of long tail keywords in every shopping phase (See, Think, Do, Care). The strategy here should be a long-tail content strategy plus brand awareness based on content and online PR. When defining the maturity of your users/market, always consider when the Internet penetration growth started. If it started a year ago, you should be dealing with a low-maturity market. Take into account the future growth also and choose your strategy accordingly. Local competition may be a good marker of what works in the market, but also may give you an insight of where opportunities lie when you find a gap in your competitors’ activities. Use SEMrush to gain competitive data and look at your competitors’ websites and get inspiration from their content and keywords. Which channels should we be on? What languages should we use to communicate? What frequency of communication should be best? What tone of voice and topics should we use? Example: Let’s say you sell licences to your software for users with depression. You found out that users in Brazil use blogs and discussion forums to seek information about how to fight depression (phase “Think”). They communicate in Portuguese. At the same time, users in Portugal and using slightly the same channels. You have a colleague on board who speaks Portuguese fluently. She’s comes in twice a week. That’s a good frequency to respond to comments, at least at the beginning. So, the task you set will be as follows: communicate with Brazilian and Portuguese users about how to fight depression on blogs and forums, 2-3 times a week. With the rising importance of local SEO, local NAP information (name, address, phone) can make your local website version more competitive in the local context. You can use one of the virtual address services e.g. www.yourcityoffice.com for setting up a virtual local branch. The importance rises when your business has some local aspirations: e.g. you run a local showroom or you deliver products locally. Websites that are earning their presence in a remote market always struggle because of low trust at the very beginning . Work on your trust signals that will help you build trust among local users more quickly. Write about what’s happening locally and try to engage locally. Create visual content, e.g. photos of a team member and local people. Your local presence would then get a lot more believable. E-commerce certificates is a must in some markets e.g. Germany, where there is a strong legal pressure on local businesses. Use TrustedShops for German-speaking countries or TrustPilot for most European countries. Research what certification authority is trusted among local users. If you want to sell locally to end-customers, some markets require registration with a local commercial chamber or register. Find a local commercial authority and research information there. Testimonials or references from real local customers or even better, influencers, may give your website a significant trust signal. Approach local influencers and offer them a free subscription or product for testing in exchange for using their statement on your website. Make sure that legal stuff is present on your website and in accordance with respective local legal regulations. Bear in mind that the statement “These Terms and Conditions are governed by the laws of the State of /your home market/” may be perfectly legitimate, but does not always work as a positive trust signal. Money-back or satisfaction guarantees work well as a trust signal. Good local rating is one of the strongest trust signals. Facebook or Vkontakte offer local reviews plugins if you run a local business page there. Also consider field-specific services like TripAdvisor for accommodation services etc. 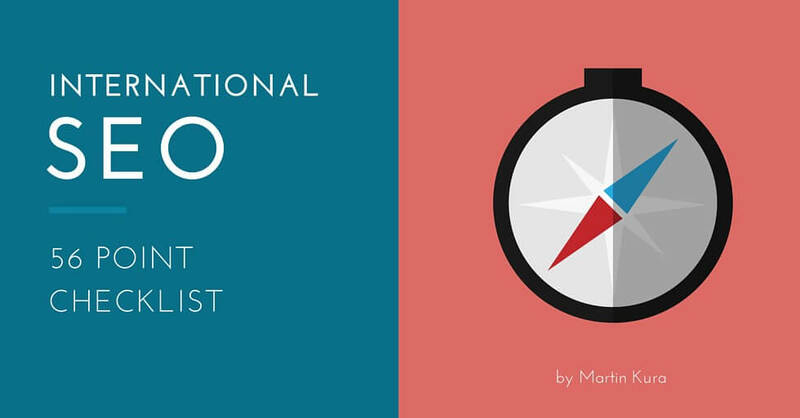 Find more tips on redirects in this blog post: International SEO & Geo IP Redirects. You can’t do international SEO without a strong team behind it. It’s virtually impossible to handle all tasks in one person. Think carefully of who to hire. Think of any new member as a key member. Ask yourself: What would this person do if my international business struggles? Is s/he committed? As mentioned in the previous point, some cultures have different understanding of the importance of completing tasks in time. For instance, in Indonesian, the exact meaning of the word “tomorrow” means “any time after today.” In German or Spanish, it has also stands for “morning.” Always use clear and simple language and specific assignments with clearly defined deadlines to avoid misunderstandings. Also, some cultures need their time off for daily rituals. Learn about cultural specifics in The World Factbook. I use ProWorkFlow because it allows me to create projects and batch add tasks. I have also heard a lot of praise for Basecamp, so I guess it could be the right option, too. Project Manager: A person responsible for running multilingual / international projects. Deputy Project Manager: A backup project manager if the head PM is not available. Content Officer: A person solely responsible for the quality of your multilingual content. Communications Officer: A person responsible for external communication: consistency, quality, community building, helpdesk. It should be crystal clear who oversees an important part of the project, even when one team member handles multiple roles. Create a test project in the first month. Troubleshoot issues that arise and note them down. Use them to fine tune the project template. Collect feedback from both users and team members. Don’t forget to upload the KPIs above into your project management system so you are able to oversee the core quality indicators. High bounce rate is the first warning sign indicating that something is wrong. It could be the content (something the users don’t like, don’t care about or don’t understand). Try to find the cause. Sometimes, in specific cases, even high bounce rate could be OK.
Another quality indicator is conversion rate. If it’s very low even after a few months, you should think of the reasons why users abandon your website without performing an action: check the Conversion funnel to find out when they are leaving and where they go instead of converting. What sort of information do they miss along the conversion path? Check if there is an increase or decrease in KPI values (see above). If the numbers aren’t steadily increasing, don’t panic. Focus on the long-term trend and evaluate the cause of the ups and downs. Follow all KPIs, not just traffic or rankings. Special thanks to my friend, SEO Analyst Zbynek Hyrak (@OptimalizovanyW) who provided valuable information on international SEO analytics.